If there has ever been a time to start beekeeping, it is now. A beekeeping starter kit is hands down one of the best ways to get started in beekeeping. 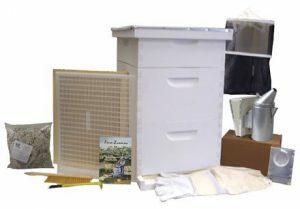 These kits are available at the click of a mouse and you have literally dozens of articles on this site and others that lay down the hows, dos, and don’ts of beekeeping. However, there are quite a number of starter kits on the market, and finding the one that’s just right for you may prove to be a task. Luckily, we here at BeeKeepClub have done our tests and compiled what we think are the best beekeeping starter kits available in the market right now. Let’s check them out. So what about the Bees? Harvest Lane Honey is a reputable supplier of beekeeping supplies, producing a wide variety of products in the beekeeping industry. Their products meet quality and safety standards. The Harvest Lane Honey Beginner Beekeeper kit is minimalist. It does not have too many items in it but only the essentials that are needed for you to start your beekeeping journey. A Langstroth hive with one brood box. Hive tool for your beehive and swarm maintenance activities. Bee smoker with an accompanying packet of fuel pellets. To read our full review of the Harvest Lane Honey Beginner Beekeeper Kit, click here. 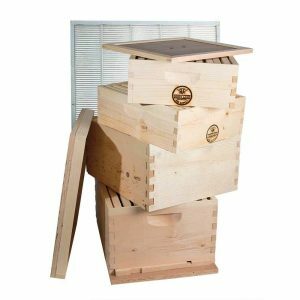 The Langstroth beehive in this kit has one inner cover and a solid bottom board. The top is flat and water-proofed. There are a number of items you will need to purchase separately from the Harvest Lane Honey beginner beekeeper kit. Of most importance is protective gear. This kit does not come with protective clothing or any instruction manual. Additionally, the kit has a solid bottom in place of the more agreeable screened bottom. This kit is shipped while fully assembled. It may get some minor damage during shipping. This often occurs to the bottom board or cover of the hive. Due to the solidness of the included Langstroth beehive, the damage that the kit could suffer is minimal and easily fixed once the kit reaches you. 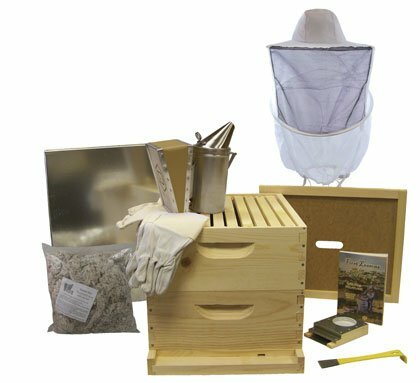 This beekeeping kit covers most of what you will be doing in beekeeping. It starts you off well into beekeeping while not exerting pressure on your pocket. The kit is good for beginner beekeepers that already have their first hive and all the additional equipment that is needed in beekeeping. It serves as a good second or third hive for your apiary. The Little Giant HIVE10KIT Beginner Hive Kit enables you start beekeeping and carry out hive maintenance activities quickly and easily. It even comes with a beekeeping guide. High quality is seen in this beekeeping starter kit. The hive in the kit is built in the reliable Langstroth design. It contains 10 frames that have foundation pre-installed on them. Beginners in beekeeping will find it easy to assemble and set up their apiaries with the Little Giant HIVE10KIT Beginner Hive Kit. Joints in the included Langstroth beehive come together nicely and tightly. You are free to add some reinforcement where you find it necessary. Most of the other items in the kit arrive in good working order even after undergoing the rigors of shipping. Little Giant has clearly put together a great kit for beekeeping beginners. The beekeeping supplies company factors in customer feedback to improve their products and make them better. To read our full review of the Little Giant HIVE10KIT Beginner Hive Kit, click here. A beehive with one deep box. Beekeeping veil that suits both men and women. This kit has all you need to start beekeeping. However, it does not include equipment and tools for honey harvesting. The smoker, hive tool and veil in the kit are useful during honey harvesting, but you will need to buy items such as an extractor separately. Little Giant has friendly and effective customer service. If you find any defects in this kit, they are quickly resolves in a manner that leaves you very satisfied. Flow is one of those brands that is fast becoming a household name, despite only coming about in 2015. 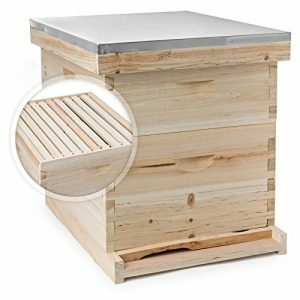 Their Classic Cedar 6 Frame beehive unit boasts a number of appealing and innovative features. The brood boxes and supers are built using Western Red Cedar, one of the best materials for beehive construction. It is resistant to fungus and puts off all kinds of insects that might invade the beehive for whatever reason. The unit also has a screened bottom board, a roof, inner cover, and a queen excluder. The roof directs rain water away from the hive and also shelters the bees from direct sunlight. This ultimately provides a good habitat for the bees to thrive. To read our full review of the Flow Hive, click here. 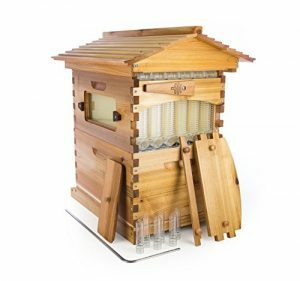 The Flow Hive Classic Cedar 6 Frame beehive is delivered with an assembly manual that is easy to read and follow that makes it easy to put together the unit. Furthermore, the brood box has 8 standard foundationless frames and the super has 6 Flow Frames in addition to honey collecting tubes and a Flow Key. This is simply a highly sophisticated beehive unit designed for the serious beekeeper. The unit is easy to assemble the unit and I applaud its sophisticated features, that is, the Flow Frames, Flow Keys, and Flow Tubes, which allows you to extract honey directly from the hive, without the need of a honey extractor. The Goodland Bee Supply GL-2B2SK Double Deep Box Kit comes with two deep boxes and two shallow super boxes. It assembles into a Langstroth beehive with bottom entrances and a telescoping top cover for the beehive. The kit is a complete beehive solution since it comes with frames, foundations, top and bottom covers, an entrance reducer and a queen excluder. All is needed is you to assemble the beehive and place it at a nice location. All parts of the beehive come unassembled. This includes the boxes and beehive frames. Goodland ships the kit dissembled to avoid damage to the parts. During assembly, you may reinforce the joints using small nails or screws. To read our full review of the Goodland Bee Supply GL-2B2SK Double Deep Box Kit, click here. This Goodland Bee Supply GL-2B2SK kit is largely made using wood. It gives your honeybee colony ample space for colony population growth and honey storage. The fully assembled beehive is more than adequate for a nicely sized honeybee colony. Beekeepers have the option of adding another one or two super boxes onto the assembled beehive if they wish to. You will be happy to note that this beehive kit comes in a 10-frame size. Goodland Bee Supply has made this double deep beekeeping kit with the end user in mind. It features nicely shaped grooves cut into the boxes for easy handling. They make it a breeze removing boxes and replacing them on the beehive stack once the kit is assembled together. The joints on all wooden pieces in the kit also come together nicely to give you firm joints. A Goodland Bee Supply logo is burnt into one side of each beehive box in the kit. This gives you an assurance of quality and that you are buying an original product from Goodland. The Honey Keeper Langstroth Beehive Kit is one of the best beekeeping starter kits to kick-start or scale up your beekeeping enterprise. It comes unassembled and has everything you require to get started. Once assembled, you can apply some paint or tung oil as finish just to add some aesthetic value to the kit. This 20-frame box has 10 deep and 10 medium sized white pine material frames that have been separated. They have unwaxed foundations and a hexagonal shaped surface. To read our full review of the Honey Keeper Beehive 20 Frame Complete Box Kit, click here. The Honey Keeper Langstroth Beehive has a dimensions 23 x 18.25 x 19.75 inches. All the finger joints of the hive kit are pre-cut and the nails are delivered with the package. All you need is a hammer for building your beehive. It does not take much brain work to build the hive and therefore you need not worry about the process of assembling the unit. Galvanized metal roof which protects the hive from bad weather. This beehive kit is easy to assemble and it is sturdy. I highly recommend it. The Mann Lake HK170 is an excellent beehive starter kit. In provides room for expansion once the bees draw most of its foundation. It is one of those kits that grow with your business since it allows an addition of a second deep hive body unlike other starter hive kits. The Mann Lake HK170 comes with an assembled 9-5/8 inch hive body, and ten assembled wood frames measuring 9-1/8 inches that have Rite-Cell foundation that are waxed. It also includes an assembled telescopic cover that has an inner cover and a pre-assembled bottom board that has an entrance reducer. 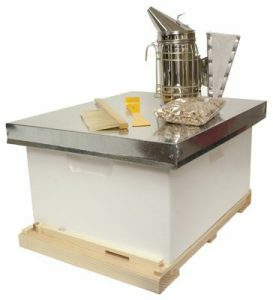 It is an excellent traditional complete hive kit for both the novice and the pro beekeeper. To read our full review of the Mann Lake HK170 10 Frame Traditional Complete Hive Kit, click here. All the items included with the kit are made of good quality materials, and since they come assembled it will not take much started for you to setup the entire unit and bring in your bees. Nonetheless, this unit is not pre finished and thus you might have to seal or paint it. You are also responsible for the bee space therefore you have to ensure the gaps between frames are properly stacked. There is fun in beekeeping with the BuildaBeehive Gold Standard Beehive Starter Kit. The fully assembled kit is among the fastest way that new beekeepers can use to get a strong start in beekeeping. The kit is made of good quality wood that lasts for long. The kit comes fully assembled minus the bees. It prides itself in two brood boxes and a super box. The super is built in an extra-medium size. The beekeeping guide included is First Lessons in Beekeeping written by Keiths Delaplane. The Gold Standard Beehive Starter Kit is built by BuildaBeehive. The company has been in the beekeeping supplies business for long enough to streamline their customer service to excellent standards. BuildaBeehive stands by its products and offers a cash-back guarantee on all its products. Beginners in beekeeping will find the Gold Standard Beehive Starter Kit very useful. It has enough items in it that you will need only to buy a few additional items. The size of the Langstroth beehive in the kit is big. It allows you to have a large colony of bees that will produce a lot of honey quickly. Super boxes that you buy separately from your beehive can be a big letdown, it may not sit well on your hive. This gives you an additional task of making adjustments to it in your quest to have it fitting well with your beehive. BuildaBeehive have saved you from this hassle by including a super box in this beekeeping beginners’ kit. 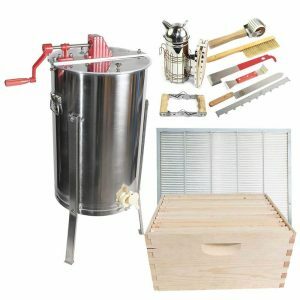 Another great starter kit that comes with most of the tools and equipment needed for beekeeping. 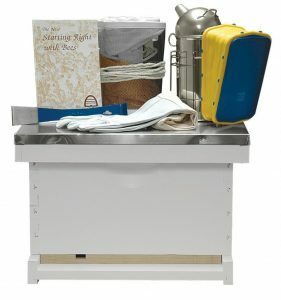 The unit features a Goodland Bee Supply 2 Frame Stainless Steel Manual Honey extractor and a complete beehive kit. The honey extractor is nothing fancy, but it is durable and works well – a great tool for beginners. All the inner and exterior components of the beehive kit are impressive. It has 2 large kiln dried pine supers that have 20 frames measuring 9 inches each. It also has 20 pre-waxed plastic brood box Pierco Foundations. Two wooden handle hive tools. A bottom board that has an entrance reducer. To read our full review of the Goodland Bee Supply GLESUPERX2CTS1 Complete Beehive Kit, click here. This beehive kit is covered by a warranty and therefore you are guaranteed of quality for your money. The main drawback associated with this unit is that it does not include any beekeeper beginner book or guide. This is an ideal 10 frame traditional starter kit designed for all skill levels: beginner, hobbyist, or professional. It is a US made beehive kit that is delivered fully assembled from a top manufacturer. In addition to that, it features all the best accessories required for beekeeping. The hive body has a dimension of 9-5/8 inches and it is already painted. 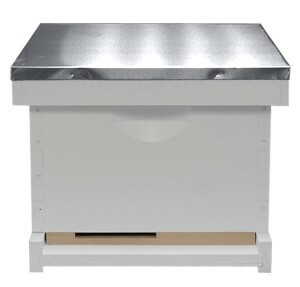 Available also in this hive kit are 9-1/8 inch wood frames that have waxed foundation, a bottom board with reducer, already assembled, and an assembled telescoping cover and an inner cover. To read our full review of the Mann Lake HK110 Basic Beekeeping Starter Kit, click here. The Mann Lake HK110 hive kit is quite outstanding when compared to some other hive units available in the market today. 10 frame traditional hive for beekeeping. Fully assembled upon delivery and ready for use. Comes with telescoping cover already assembled and with an inner cover. Hive body is 9-5/8 inches and already painted. Wood frames have a dimension of 9-1/8 and are assembled and have foundation. A pair of economic leather gloves. A beekeeping book entitled Starting Right with Bees. Gloves that fit any bee suit. One 10-frame 6-5/8 inch wooden super. Ten sheets of plastic foundation. Ten top bar frames measuring 6-1/4-inches. To read our full review of the BuildaBeehive 10 Frame Deluxe Beehive Starter Kit, click here. Just like all other BuildaBeehive products this starter kit is covered by a money back guarantee and therefore if unsatisfied for any reason you are free to return the item for a refund of your money. Only a few manufacturers give such an offer and that is one of the reason I never hesitate in recommending BuildaBeehive products to a friend. A important benefit associated with the ten frame unit is that you can add in more equipment to your hive whenever you want to expand. The only flaw with this unit is that it comes unassembled which may be a challenge to the beginner. But overall, it is a great unit and I recommend to any one whether pro or beginner. It is good for those who would like to start cheap then later get an expensive one. You might have noticed that none of these beekeeping starter kits come with the most important thing needed for beekeeping – the bees! So, where can you get them? Well, there are two ways you can go about doing that. You can either buy your bees or catch your own swarm in the wild. Buying bees is more straightforward, but I bet you’re wondering how you can going about catching your own in the wild. Well, let’s talk a bit about that. The very idea of catching an entire swarm of bees scares so many but it is really possible. A swarm is ideally a term used to describe the mechanism employed by bees when they want to propagate their species. A bee colony has to divide and migrate when it grows and becomes too large. This makes it impossible for the bees to survive on small space and hence the need to divide. Instances where the colony has two queen bees will also result in swarming. The bees will moves with the queen that is responsible for laying eggs that will build the future generation. A swarm will not last for more than a week in most cases. If it does, it becomes a hive or colony. In order to safely catch and establish a bee colony using a swarm, you need to identify whether it is really a swarm or a cut-out. A swarm is really easy to handle since it is a group of bees that have not built or are in the process of building a comb. An established colony is called a cut-out and will take the hand of a professional to catch. It is important to note that bee swarms do not last long. Ideally it can rest for an hour or for 24 hours before moving to their preferred location. One of the reasons for this is the fact that the queen bee is not strong when it comes to flying given its large body and its regular bee size wings. It therefore needs some stopover during the swarming process. During these periods of rest, the bees search for a new home. In some instances, they might be hindered by bad weather and hence the long stay. A bee swarm is in most cases docile since they do not have honey stores, brood, or most importantly – a home. They are also full of honey and hence the docility. Bee colonies that are established are territorial by nature and thus defensive. They should therefore be handled with skill. There are various techniques for catching a bee swarm. The main goal is to get as many bees as possible into the box on the first try. When you get a majority of the bees in the box, chances are high that you got the queen as well since her main place is at the center of the swarm. If you fail to get her chances are high that she will still follow the rest of the bees into the box. This technique will work when the swarm is hanging on small branch. Use a clipper to cut the branch and lower it into the beehive box. Those with Warre or Langstroth Hive should leave the frames in place when placing the swarm in the hive. The bees will find their way and hang from the top of the frames. Some of the bees may fly away when you use this method but they will find their way into the hive. It also creates the perception in the bees that they found the new place on their own and hence will likely stay in the box. A bee swarm stationed high up in a tree and out of your reach can be secured using this technique. The branch may be too thick also and hence the need to use this method. The technique should be carried out quickly and with precision. Position your box well below the branch and shake the branch. Most of the bees may fly away but majority including the queen will land in your box. Those that fly away will eventually find their way into your box. Once you get the swarm in the hive box do not disturb it for at least a week. They need this time to build the combs and begin raising brood. If bothered, the bees will definitely abandon the beehive since nothing holds them from leaving. You may already know that there are four main types for bee hives: the Langstroth bee hive (which is arguably the most popular), the top bar bee hive, the Warre bee hive and the British Standard National bee hive (which as the name suggests, is mainly used within the United Kingdom). Let’s discuss each of them in a bit more detail. This is a popular choice among beekeepers. It derives its names from father of modern beekeeping: Lorenzo Lorraine Langstroth. Similar hives across the globe have similar designs to the Langstroth hive and have similar names. They are common in various regions across the globe including: South America, Europe, Australia, Asia and North America. It is extremely easy to harvest the honey. It facilitates an easy access to the honey stores and this can be carried out without disturbing the queen. Standardization makes this hive type the best for beekeepers whether small or large scale. The components are standard in size and shape and that means you can take the honey frames and brood from a stronger hive and share with a weak one. It also makes it easy to find replacement parts when needed. Portability is a great advantage associated with this hive. Its components can easily be disassembled and restacked and thus it makes it easy to move this type of hive. Maximum productivity is attained through this hive. Its design allows for minimal drone production and maximum brood and honey production. They are the best for rearing queens and pollen and propolis collection. They are the best choice for learners. Tons of information is available on use and management of these hives. Pretty heavy when fully packed with honey and brood. This type of hive is not so much appealing to the eye. They lack the natural design that allures bees. This type of hive has been around for many years. They have a simplistic design and never use any artificial foundation. They are normally triangular boxes on legs and have a lid in addition to screened access on its ends. Some beekeepers add plexiglass panel on of its sides so that they can observe the bees at work. You can set this up on your own and thus it is much cheaper. Easy to harvest the honey since all you have to do is work on one frame at a time. It eliminates the hassle involved in lifting heavy supers. With this type of hive the bees are least disturbed. Economical terms of space usage. Set aside one side until it is needed by the colony. Affected by changes in temperature. Extreme heat and cold can devastate colonies. Does not offer standardized equipment. Inconsistency in production. Difficult to determine how much to leave or take. This type of hive derives its name from Emile Warré, a French Pastor. It has a completely different design when compared to Langstroth hive. It was created in early 1900s after some experimenting on various hive types. This resulted in what was to be referred to as “The People’s Hive”. Its overall design is smaller and its components square in design and not rectangular. As for this type, the boxes are added to the bottom and not the top also. Minimal intervention by the beekeeper is required for this type of hive. Its overall design is like a hollow tree which can withstand extreme cold and hot weather. The bees are provided with foundationless frames where they can build their comb. This gives the bees maximum control which results in healthy and more productive bees. Moisture and temperature well regulated thanks to the insulating box of sawdust placed in between 2 cotton fabric layers. Quite stylish unlike some other hive types. Looks good in your backyard. Requires some serious thinking if you need to supplement your bees with food since it lacks front feeder. It costs much more when bought. Makes honey harvesting a serious affair. Requires more effort unlike Langstroth hive. Requires two or more persons to add supers since it is built bottom up. This is popularly referred to as the National Hive and it is similar in design to Langstroth hive. Its signature feature is the smaller dimensions and shallow brood chamber when compared to a Langstroth. It boasts an open-mesh floor that allows the beekeeper to monitor varroa infestation. It also has deeper standard boxes, a roof, shallower honey super boxes, and stand. Facilitates easier monitoring of Varroa mites. Allows for a two-way orientation of the frames; parallel or perpendicular to the entrance. Offers excellent ventilation for the bees. Can be handled by one person even when full of honey. Can utilize up to 12 frames (14 x 8-1/2 inches or 14 x 5-1/2 inches). Best suited for non-prolific bees. May not be ideal for heavy producers. Beekeeping is a fascinating venture and it becomes more exciting when you know what you are doing. Any of the best beekeeping starter kits listed above can make it so much easier for you to grow your bee colony and scale up your operation. These kits are excellent for all beekeepers – whether novice or professional. Some come assembled whereas others are unassembled. Choose the one that best meets your budget and needs. Additionally, understanding how to catch a bee swarm can help eliminate the need to buy bees. Do you own any of the beekeeping starter kits on this list? Which other kit(s) do you think should be added to this list? Leave a comment below and let us know. Brushy Mountain closed last year. Yes, it’s a shame that had to happen. The article has been updated.